SpaceX’ is hoping the fourth time will be a charm. For the fourth year in a row, SpaceX is trying to significant increase its launch rate. Space Exploration Technologies Corp, better known as SpaceX, plans to launch its Falcon 9 rockets every two to three weeks, its fastest rate since starting launches in 2010, once a new launch pad is put into service in Florida next week, the company’s president told Reuters on Monday. “We should be launching every two to three weeks,” SpaceX President Gwynne Shotwell told Reuters in an interview on Monday. During each of the past three years, the company tried to vastly improve its launch cadence only to hit significant setbacks. After launching three times in 2013, SpaceX planned about a dozen launches in 2014. It managed only six flights due to delays caused by leaks in helium tanks. In 2014, the company reeled off five successful launches before the sixth vehicle exploded after liftoff. The cause: a helium that broke loose inside the second stage liquid oxygen (LOX) tank. The company finished the year with six successful flights in seven attempts in a year during which the Falcon 9 was grounded for six months. 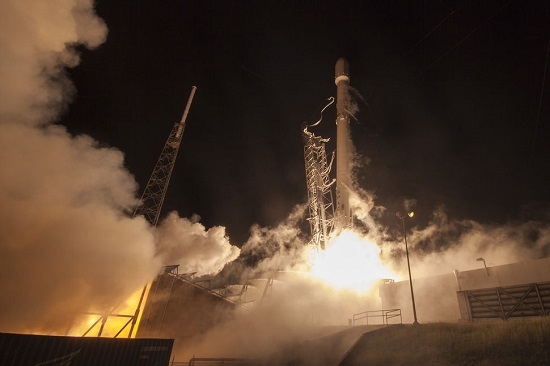 Eight more launches followed in 2016 as SpaceX aimed for 18 flights. However, the ninth rocket caught fire and exploded on the launch pad while being fueled for a pre-flight engine test. The cause: a large breech of a helium tank inside the second-stage LOX tank. The rocket was grounded for four months, returning to flight in January. That remains SpaceX’s only flight this year, although the company is planning two launches by the end of February. The first flight, set for Feb. 14, will launch a Dragon resupply ship to the International Space Station. The second, scheduled for Feb. 28, will carry the EchoStar 23 spacecraft. SpaceX is also planning to launch the SES 10 communications satellite in March. That flight will feature the first use of a previously flown Falcon 9 first stage. All three flights will take place from the historic Launch Complex 39A at NASA’s Kennedy Space Center. The launch pad previously hosted Saturn V and space shuttle missions. SpaceX’s main launch pad at Cape Canaveral Air Force Station remains under repair after it was damaged by the Falcon 9 accident last September. Shotwell did not reveal how many launches SpaceX is aiming for in 2017. However, assuming the company gets both flights off this month and hits a launch cadence of every three weeks thereafter, SpaceX could launch 17 rockets this year. On the schedule for this year is one, and possibly two, flights of the long delayed Falcon Heavy booster. The rocket includes three Falcon 9 first stage cores with a total of 27 engines. The first launch will be a flight test; the second will carry an Air Force satellite. SpaceX is also scheduled to fly an automated version of its Crew Dragon spacecraft on a flight test to the International Space Station. However, that program is already running 20 months behind schedule, and there are unconfirmed reports of additional delays that have not been announced. Here is to hoping that they can avoid any issues and continue that with block 5. As far as human launch, hopefully, they will be able to launch uncrewed this year. Good luck to Space X! I’d aim for “No losses this year.” before I said I’d try to launch every two to three weeks. But best of wishes. The projection of 17 potential launches this year is for LC-39A alone if a cadence averaging a launch every three weeks is achieved. But SpaceX has a working pad at Vandenberg AFB too and is likely to do up to a half-dozen more launches from there by year’s end. That adds up to about two dozen missions in total. Offhand, do you know when the other 2 pads( tx and Canaveral ) will be ready ? Boca Chica, Texas will probably be online by 2019. Very little work on the actual launch complex has started yet, it’s mostly just a big pile of dirt at the moment. Basically all hands were scrambled to LC-39A to work there. I would expect major work to start there this spring after LC-39A is running smoothly. SLC-40 should be operating again this year, the rumors vary greatly, anywhere from mid year to late in the year, probably depending mostly on how much work it takes to refurbish the strongback. Kind of wish those were reversed, but at least they gain 3 pads, at 2 sites this year. However, my understanding is that Canaveral and Kennedy use the same spotting gear which requires manual config. Is that true? IOW will they be able to launch same day from the 2 pads? If Falcon 9’s constitute most of the launches from both pads, I’m not sure that matters. Autonomous FTS is in works at the Cape now. Both ULA and SpaceX are participating in this effort. This will allow launching ULA and SpaceX close together in time without re-configuration of the range assets. Also needed for FH to fly as they need to deal with one stage going downrange while two are coming up range toward LZ-1. Current (old) radar isn’t going to cut it. My understanding is that the range requires a few days to reset between launches. That is what I thought as well. I wonder if spacex will solve that issue as well? Each launch site is used for different types of orbital paths. Something scheduled for one may not be able to launch from the other. True. The Vandy pad is only suitable for polar or other high-inclination orbits. But these orbits are getting more popular as they provide better coverage of more of Earth’s total surface than more equatorial orbits do. Lots of LEO constellations for imaging, weather data and communications will go all, or mostly, into such orbits. Example: Iridium Next. SpaceX already put up 10 of their birds on the RTL Falcon 9 mission on Jan. 14. Over the remainder of 2017, four or five more essentially identical such missions should also launch from Vandy. And SpaceX has some other high-inclination missions on its dance card, at least two of which should be up by year’s end. SpaceX is never going to launch GEO comsats out of Vandy, but the smallsats-to-LEO-high-inclination market is the fastest growing part of the launch market.